Biography: Born on July 10, Bonnie Russavage grew up in Southern California with her parents Janis and John & younger siblings Vanessa and Joseph. Bonnie always dreamed of becoming an actress and performed in many plays before she was "discovered." She had to endure eleven auditions before finally landing the role of Vicki Needleman on Saved By The Bell: The New Class. 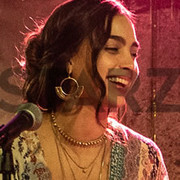 She described her role as Vicki as " cute and cool but she`s a hypochrondriac" Bonnie was on the show during the first season after which she was replaced by an another character. Not much else is known of Bonnie Russavage. After her leave from The New Class she seemed to disappear from the airwaves. *** If you have any info on Bonnie Russavage please e-mail me at: auroa360us@yahoo.com. All credit will be given and all help is much appreciated.